Winter’s Bone tells the story of 17 year-old Rae (Jennifer Lawrence) who, determined to protect her family and her home, embarks on a dangerous mission to find her missing father - dead or alive) in the hostile environment of Missouri's Ozark Woods. This film is one of the many on my list that I have been aware of and have been meaning to see. I am not sure why it took me so long to be honest. I think it is to do with the gritty nature of the film - I was worried that it would be a tough watch. 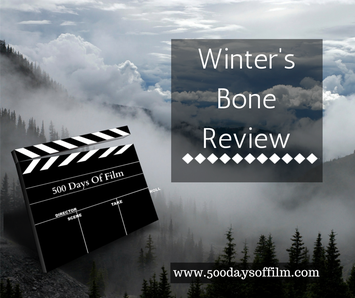 I just was so impressed by Winter's Bone. Yes it is gritty. Yes it is bleak. But the story and the central performances are so powerful that I soon realised that there is nothing wrong with a bit of grit. The entire film hangs on Jennifer Lawrence’s Rae. For the story to work, you have to believe in her and her terrible situation. You have to feel her desperation and understand what motivates her to take such dangerous matters into her own hands. Lawrence proves more than up to the challenge and produces a remarkable performance. There is nothing showy about it - she is authentic, human and just incredibly determined. I cared about and believed in her completely. As the tension in Winter’s Bone builds, you feel a mounting sense of dread. I knew that, whatever the outcome of Rae’s search, no one was going to come out of this story unscathed. And yes, some scenes in the film prove to be pretty disturbing. However, this is not a result of what you see but rather what is implied. I left the story genuinely invested in the characters and moved by the fact that the conditions in which they live are all too real. You can sure see a lot of Katniss Everdeen in Rae. There is a pretty heartbreaking portion of irony at the start when Rae visits a local school and sees that her contemporaries are learning how to take care of a ‘pretend’ baby.